in Search Marketing with tags AdWords, Customer Match, Gmail, Google, RLSAs, YouTube Both comments and trackbacks are closed. Google made headlines at the onset of Advertising Week with the launch of Customer Match for AdWords campaigns running across Search, YouTube and Gmail. The launch marks the first time that Google will allow advertisers to target audiences based on first-party CRM data and aligns with tools like Custom Audiences, which have led to big wins for brands pushing promoted content on Facebook. This move represents where search marketing is going, from targeting just keywords, to adding consumer context to those searches. As it fits within Google’s four-piece customer framework – “I-want-to-do,” “I-want-to-buy,” “I-want-to-go,” and “I-want-to-know” moments – Customer Match strengthens the connections between advertiser and customer beyond the previous limits of pixel-based remarketing lists or interest targets, and most importantly, strengthens them across channels. Being able to target users not only through keywords has long been the goal for search marketers. Customer Match is the latest feature to advance this goal, following previous product launches, including Demographics and Remarketing Lists for Search Ads (RLSAs). What sets Customer Match apart within Google is the alignment of the targeted audience to relevant content. At its core, search is still all about an ad’s relevance to site content, and the combination of relevant content and users can increase engagement and efficiency for search marketing initiatives. 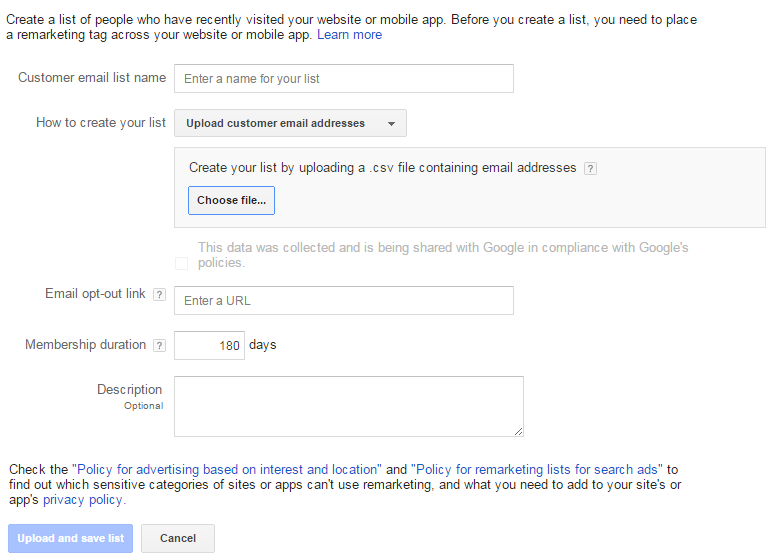 Once eligible to participate, advertisers can upload secure customer email lists directly in AdWords. Google hashes the lists to remain compliant with privacy policies and matches those emails to Google accounts, after which it discards the uploaded data. Advertisers must also provide an email opt-out link so people can manage preferences for lists to which they may be subscribed. After the audience lists are set up, marketers can target or exclude people on the lists in Search, Gmail and YouTube campaigns and expand reach with the Similar Audiences feature on Gmail and YouTube. AdWords will automatically create Similar Audiences for uploaded lists based on users’ browsing activity and shared interests and characteristics with the uploaded list. These targets can be applied to ad formats on Gmail and YouTube, including Gmail Sponsored Promotions and TrueView video campaigns. Traditional Search ad units on Google.com and its partner network are noticeably absent from Similar Audiences, and it remains to be seen if Google will add that functionality. As with any new feature in AdWords, it’s worth marketers testing this new ability at launch to determine if the targeting improves ad performance as expected. Marketers can use successes from past RLSA efforts to customize messaging in creative, adjust bid multipliers and target campaigns to the matched audiences. Marketers should leverage the years of learning from CRM segmentation for email efforts to align audience lists, and shouldn’t rely on a one-size-fits-all approach when it comes to Customer Match. For an industry powered by keywords, the context of a search query is growing increasingly important. Enhanced Campaigns improved functionality for location targeting and device bidding, Estimated Total Conversions helped advertisers better understand cross-device activity and offline visits, and now Customer Match is here and the possibilities are great.